Oral surgery is a rapidly changing field. At Cornerstone Dental, our team is committed to continual professional development and to the acquisition of modern equipment to ensure an unparalleled experience for our patients. At Cornerstone Dental we use only the most modern techniques to maximize you oral surgery success. 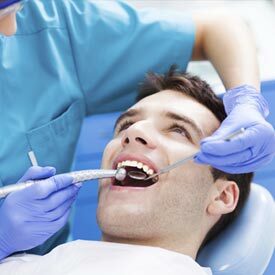 It is our experience that fear of oral surgery comes from negative thinking pattern and learned attitudes. That is why it is our goal to educate our patients, thus instilling comfort and confidence in them, while, at the same time, alleviating stress. The Cornerstone Dental team will walk you through each step of the oral surgery process, from providing an initial consultation, all the way to giving you the tools and resources for successful after-care. At Cornerstone Dental we are proud to provide full-service dentistry. We will not refer you to another dental establishment for these crucial services unless necessary. We believe that a relationship of ongoing trust and mutual respect between us and our patients is paramount. We want you to know that Cornerstone Dental is a dentist who genuinely cares for your well-being and works to understand your unique dental needs. Periodontal disease is the leading cause of bone loss in your mouth. However, you may also lose bone structure from other things such as ill-fitting dentures and/or facial trauma. Bone grafting is a way to replace lost bone tissue and to encourage natural bone growth. Bone grafting can be used for a wide variety of periodontal procedures. These days, we have the ability to grow bone where needed. This not only gives us the ability to place Dental Implants – it gives us the ability to restore functionality and aesthetic appearance. What are the different kinds of Bone Grafts? Autogenous bone graft – In this type of graft, the bone is removed from elsewhere in the body and implanted in the mouth. Common donor sites for bone grafting include the iliac section of the pelvis, the chin and the posterior third molar areas of the jaw. If large amounts of bone need to be harvested, the hip or the shin bone (tibia) are generally used. Allograft – Synthetic bone (man-made) can be created in the laboratory and used in the bone grafting procedure. Bone can also be obtained from a bone bank (cadaver bone). There are a wide variety of reasons why you may need a bone graft, but generally the most common reason is to restore the jaw bone. Call Cornerstone Dental at (403) 995-1800 to request your Oral Surgery appointment today.